There is nothing quite like the taste of a well-cooked steak in a skillet. Cast iron skillets, however, are not all created equally. Many factors like size, shape and quality can affect how well a cast iron pan cooks a steak. Here are some great tips for finding the best cast iron pan for cooking a steak. Iron has been around for dozens of centuries, and there are still usable iron pans that date back decades for one main reason: They are durable. If taken care of, cast iron pans can last years upon years and continue to add more flavor to your foods. With cast iron, you should not use soap when cleaning because this will remove the oils on it that prevent the food from sticking. 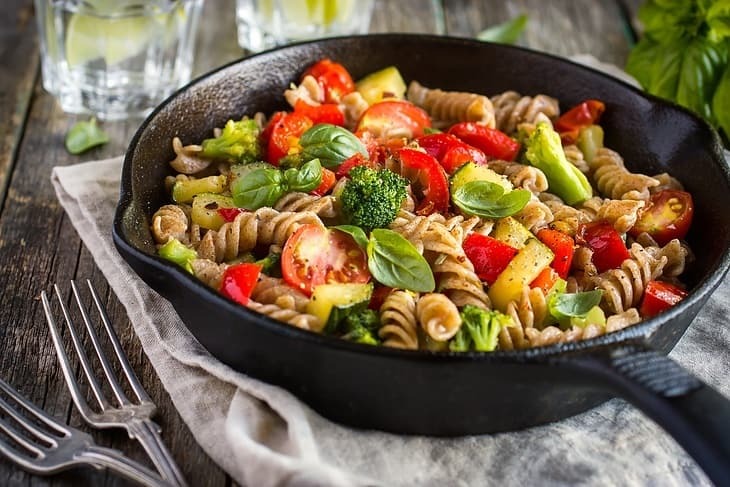 The oils bind to the iron to create a bonded non-stick surface that lasts, and a benefit to continuing to use this pan is that flavor continues to get added to the pan from previous meals in a good way. This means that all that extra flavor gets added to the juices and steak when you sear your meat in the pan. This is why I urge you to buy a quality pan that will not need to be replaced. Buying a new pan is by far better than buying a bad used one. There are, however, many things to consider when buying a new cast iron pan. Do you want to learn about another product made from cast iron? Consider having best cast iron Dutch oven in your kitchen. It is a versatile cookware that not only helps you cook many kinds of food but also serves as an useful storage. Cast iron pans come in many different sizes, and figuring out the right size for you depends on what you plan to cook. For steaks, a 10- to 12-inch pan is ideal unless you are trying to cook multiple steaks at once. Even though one of the benefits to cast iron skillets is the iron's ability to distribute heat evenly in the pan, cooking multiple steaks at once can affect your ability to create a good sear on the steak. For this reason, I recommend getting a pan that is 10 to 12 inches. 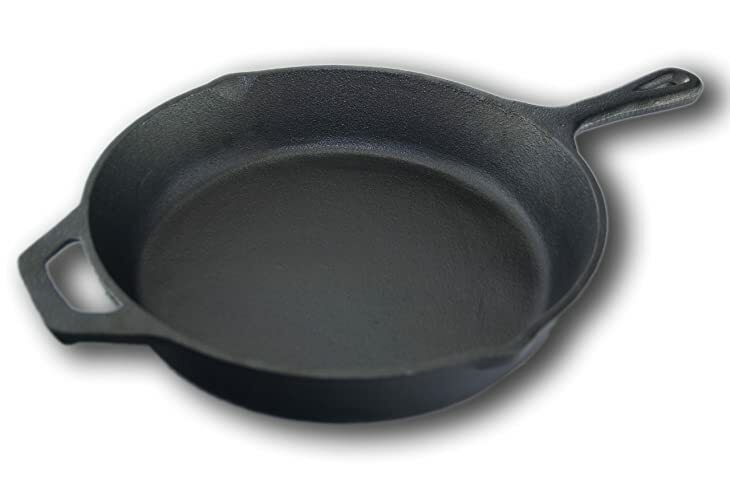 Iron has changed in composition over the years, and modern cast iron pan suppliers have created thinner pans. For durability purposes, the heavier and thicker the pan, the better. The thicker pans have the ability to last a lot longer because of the added metal, and they hold heat way better than the thinner versions. 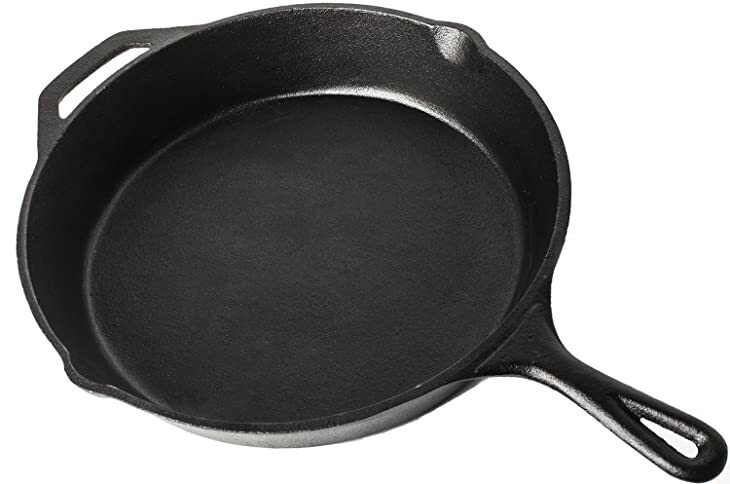 Some cast iron pans have two handles cut in on the sides, and others have one handle sticking out like most other pans. For the handle, I recommend finding a pan that suits your preferences and feels most comfortable. Having the two side handles might be better f﻿﻿or bakin﻿﻿g if you wanted to use it in an oven, but for cooking a steak, the handle type makes a negligible difference. When buying a new cast iron skillet, there are different surfaces available. Some have a coating on top of the iron that creates a non-stick surface. This glassy-smooth, non-stick surface can make things easier for any cook. Another type of cast iron surface is one that has been preseasoned. The final type of surface you can buy is one that has been untreated. I recommend the untreated surface for cooking the best steaks for two main reasons. The first is they are significantly less expensive. The second reason is that you can season the pan yourself. This will require you to bake oil into the pan before you use it, but you also won't be at the mercy of someone else's preseasoned iron pan. 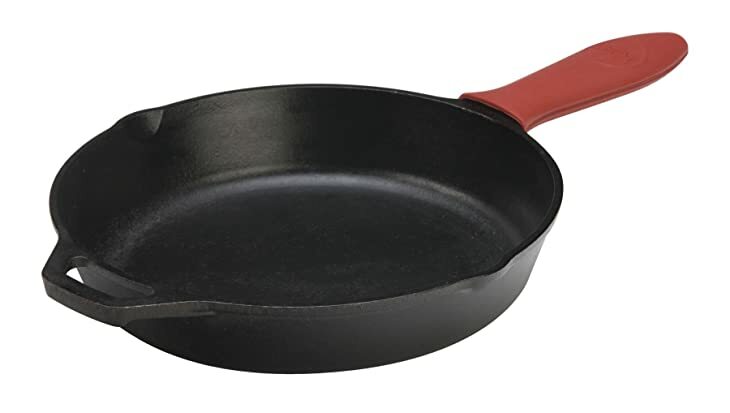 Furthermore, the coating on the pretreated cast iron pans can eventually scrape off, and this often results in the cast iron not lasting as long as the untreated iron. This is why I recommend buying a cast iron pan without any coating. For more in-depth explanations of the types of cast iron skillets available to you, here is a great website. For step-by-step instructions on exactly how to cook the perfect steak in a cast iron pan, click here. The handle of this particular skillet comes with a silicon covering that allows you to position and move the pan without being burned. The larger diameter allows for more steaks and foods to be cooked at once in case you have a family or are cooking for many people in a short amount of time. This pan is already treated with oils, so you don't have to treat it yourself, and this makes it ready to cook with right out of the package. At 8 pounds, the weight is a great and makes it very durable. This increases the longevity of the pan. The pan being pretreated leaves you at the mercy of the flavors added before you cook. This will disappear as you cook more with your own flavors. This skillet's 12-inch size may be too big for those who are dining alone or just cooking for two. The silicone handle would not be advised to put in the oven if that is how you finish your steaks. The price is a little more expensive than other cast iron pans. This pan comes preseasoned with oils, which makes it usable right out of the package. The 12 1/2 inch pan size is perfect for those cooking for multiple people. * This skillet can be used to cook a wide variety of dishes on the stove top or in the oven. One long handle and one short handle make it easier to grab on both sides for mobility and switching the pan to the oven quickly and safely. There is a great warranty with a 30-day return policy by Utopia Kitchen. The item has a great weight of 8 pounds that provides durability and easy maneuverability. 12 inches may be too big for people who aren't cooking for a larger number of people. Because the pan is preseasoned, it may come with some different flavors than those desired. No handle covering means that the handle will be hot to the touch and will need to be moved with an oven mitt. The slightly rough surface of this skillet may result in towels being snagged during conditioning. 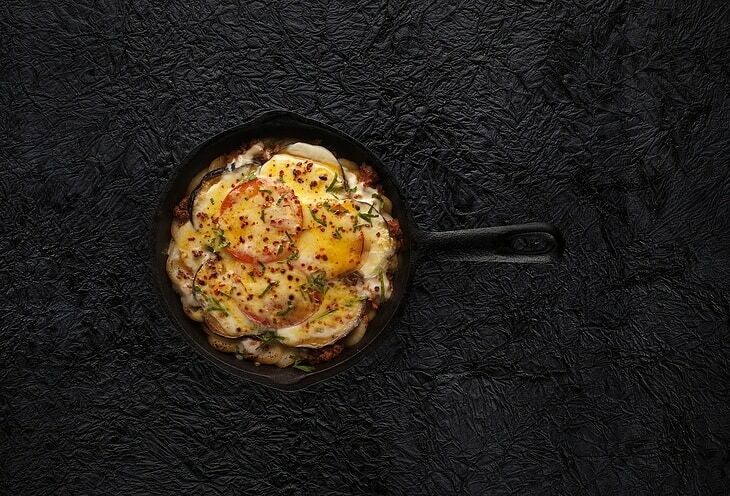 The rough surface may have less of a non-stick quality than that of other cast iron skillets. The pre-coated and pretreated interior allows this pan to be used right out of the package. This pan heats slowly and evenly so it is safe to be used at temperatures of up to 500 degrees Fahrenheit. The ceramic coating is designed to be resistant to chipping and cracking. This skillet's smooth surface is perfect for cooking steak and reconditioning after each use. The pan heats evenly for uniformly cooked foods every time. The light weight and second handle allow this skillet to be moved easily while cooking. 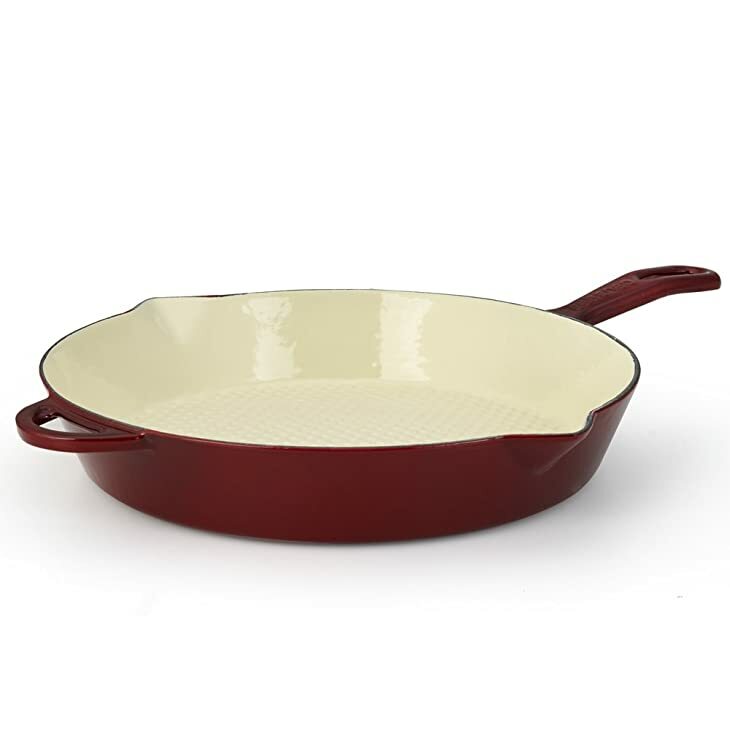 The red and white color combination is not common among other cast iron skillets. The ceramic coating can crack if metal utensils are used. Foods may stick to the enamel surface, making cleaning more difficult. The actual cast iron under the coating is very thin, which makes the pan less durable. The surface has tiny dimples like a golf ball that can allow oil to pool, which often results in more oil being used. The uneven surface will not likely create as good a sear on a steak as a pan with a smooth surface. The 10-inch pan is a great size to cook one or two steaks at a time. The pan comes preseasoned to be used right out of the package. This skillet is deep, which is perfect for sautéing veggies right in the pan with the steak or after the steak is cooked to provide wonderful flavor for the veggies. A solid weight of 6.5 pounds makes this 10-inch pan durable and easy to move from the stove top to the oven for finishing touches. A rounded handle on one side and a straight handle on the other makes this skillet comfortable to grasp with both hands. The pan features a lip on each side that makes for easy pouring. The classic black color will look great in any kitchen. 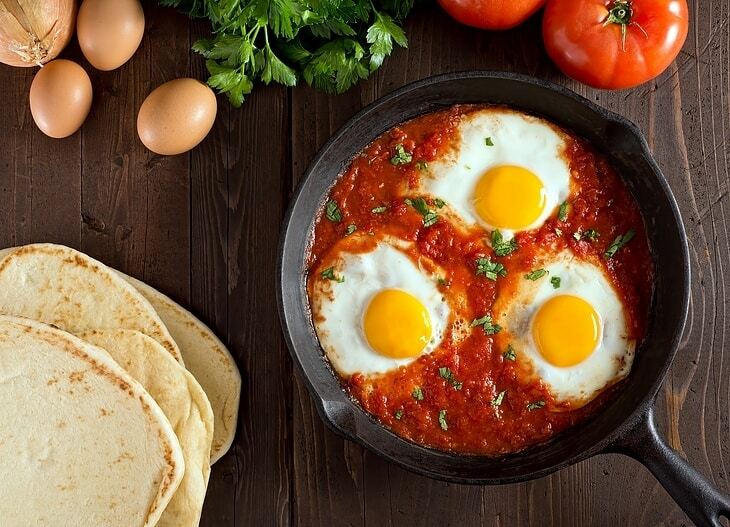 The preseasoned pan may bring unwanted flavors until the pan is used and re-seasoned multiple times. The skillet does not feature a smooth covered enamel surface. This pan can have a slightly uneven surface, which is not always ideal for making steaks. A lid is not included with this particular skillet. Grates on the grill pan will make those classic grill marks on your steak. Enamel creates a non-stick surface that makes it ready out of the box after some quick conditioning. This grill pan is oven safe up to 500 degrees Fahrenheit. The porcelain enamel is stain-resistant. The square shape provides more room for other steaks. This pan's 10-inch size is great for those with a one- or two-person household. The included lid means this pan can also be used as a food press. 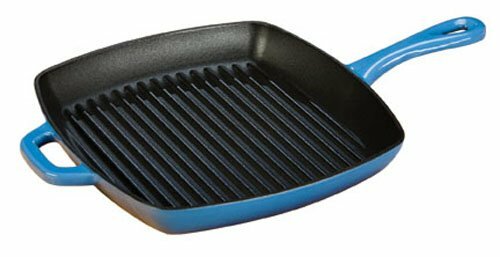 The vibrant blue color is not typical of many cast iron skillets. The price of this item is much more affordable than that of similar cast iron grill pans. The ridges and rough surface make the pan very difficult to clean. The ridges create an uneven surface that makes it harder for the steak to get a solid, even sear. The enamel coating can easily chip without proper care and has even been known to chip during careful usage and storage. Having only one straight handle and weighing in at almost 9 pounds, this pan is quite heavy and can be difficult to move from stove top to oven. After reviewing all of these products, we found that the Lodge Cast-Iron Skillet L10SK3ASHH41B, 12 Inches may offer the most benefits for cooking a steak in a cast iron pan. The build quality, thickness, surface and durability look promising. Although the price for this pan is a little more expensive than other skillets on the market, we discovered the skillet to be worth every penny. This pan is the closest to old-fashioned cast iron skillets that provide great results. It has a smooth surface, it's thick and heavy in weight, and it's incredibly durable, all of which make it perfect for grilling steaks and trapping in that desired flavor. 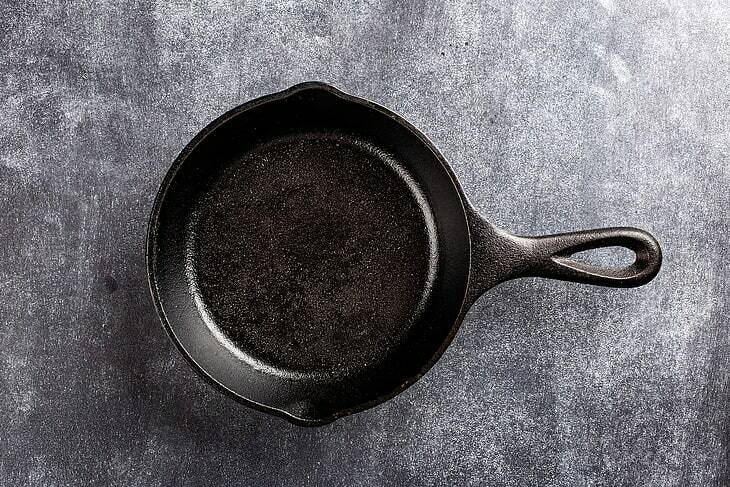 We would love to know what you think about your favorite cast iron pans in the comments. Tell us what you think about our top picks!